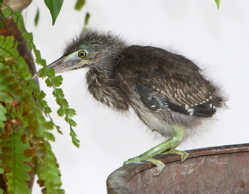 In November 2007, a baby Little Heron (Butorides striatus) was literally thrust onto me after a concerned couple picked it from the grounds of the Bukit Timah Campus LINK. It was a fledgling, probably having taken its first flight out of its nest in one of the trees around. Or did it wander out of the nest and somehow landed on the ground. Being new to the game of “rescuing” helpless birdlings (although it was not me who “rescued” it, I was eager to try my hands at caring for it. The next two months proved challenging as I struggled to feed it in an effort to keep it alive. Check out this LINK that gives the 12 posts covering its “rescue” up to its release. When the Little Heron was released around where it was picked up, it dawned on me whether the bird could manage to survive without its parents to teach it how to forage for food in the wild, how to recognise and evade predators, etc., etc. Yes, birdlings need to be taught how to survive in the wild. After my single experience on looking after this Little Heron, I was considered an “expert” and subsequently offered two Javan Myna (Acridotheres javanicus) chicks to act as foster parent LINK 1 and LINK 2. For the record, one grew up to fly off on its own while the other was predated by a stray cat when I was not looking. 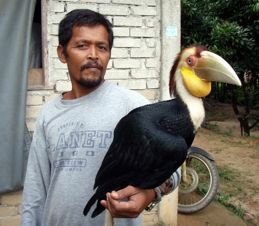 The chances of such birds surviving in the wild after their “rescue” are slim. Chances are, we nurse them to health so that they can be easy food for predators. In most cases we do not actually witness their being predated and thus feel satisfied doing a good turn. Not so for an unfortunate juvenile Pink-necked Green Pigeon (Treron vernans) that was nursed to health after rescuing it from attacks by marauding crows. At the time of release a Changeable Hawk Eagle (Spizaetus cirrhatus) suddenly swooped on it when the pigeon landed on a branch of a tree LINK. 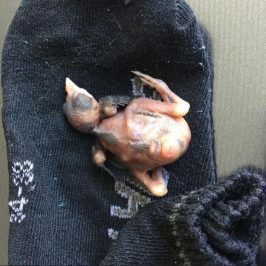 On 13th April 2008, we posted an account LINK to discourage people from picking up young birds they encounter on the ground when out on nature walks. It is natural for people to assume a fallen birdling needs help and so we dutifully picks it up and brings it home to care for it. But does the birdling actually need our help? In most cases the answer if NO. Chances are the birdling is on its first flight and landed on the ground. The adults are nearby, usually out of sight. They will not feed it as feeding is used as an inducement for the young to fly. But they have their ways of getting the youngster to hide should a predator be around. However, if you encounter a birdling by a road or where there is danger of it being overrun by a car or even trampled over by pedestrians, move it to s nearby safe spot. The adults would find them in no time at all. 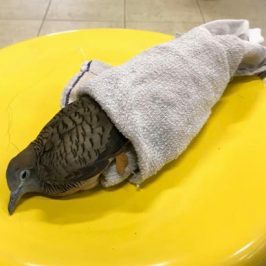 On the other hand if you encounter an injured bird, it definitely needs your care. NOTE: There is a B.A.R (Bird Alert & Rescue) Singapore Hotline: +65 81802082 that you can get on to if you encounter a birdling that genuinely needs help… LINK. ACRES Wildlife Rescue does take in young birds that are visibly injured or in need of medical attention, although like you said, the survival rate once they have been rehabilitated and released is unknown. Good job Wee. My husband & I have had bitter sweet experiences caring for injured birds, adults & young. An adult dove died from despair – had to keep overnight in makeshift cage to protect from neighbourhood cats. Lost a young green pigeon after several days of doing well – very traumatic for emotions & soul. Promised myself never again. But then my husband had an injured adult swift thrust upon him. The best we could do was to leave it free in our small garden & hope it would recover without our intervention. However our “resident” civet made a quick meal of the swift sometime between midnight & early dawn. Could not even give it a decent burial in our garden, which we did for the dove & pigeon, because only a few feathers was all that the civet left behind. If anyone chooses to care for injured birds, be prepared for hard work and a whole lot of emotional pain! In most cases, young birds will not need to be rescued as the adults will most likely find and attend to them. I have witnessed some fledglings that were seemingly helpless and alone at first. After some waiting, happy ending as the parents found and attended to them. There was also a case of a fledged owl that had fallen onto the ground and unable to fly. Some kind soul left it on a low branch of a tree when no adult birds were in sight. The next day, the fledgling was seen in a much higher branch in the same tree. It had made its own way up! One of its parents was then discovered higher up in a near-by tree. Glad to share that the owls stayed around the area for the next few months. Hence, it is wise to let nature take its course and let the natural parents attend to their offspring. Yes, only the fittest will survive and some have to die for others to survive and to regenerate and that is I am afraid, the nature order of things -a check and balance that man do best not to interfere out of pity and compassion…. ‘The adage, “One hss to be cruel to be kind” holds true in many circumstances. There is an urgency to spread this message to the young. They have to come to terms with the “cruelty” of nature in everyday life. Once I found an almost newborn kitten (eyes still closed) by the roadside squealing loudly. It was raining heavily and I was tempted to take it back to at least protect it from the elements. But luckily before I could do that, I saw what I presumed to be the mother cat returning. She hissed at me to leave her kitten alone. So don’t be too quick to react and think that you’re “saving” something. You might actually be making things worse. I also agree wholeheartedly that human-reared chicks would not stand a good chance of survival after eventual release. If I took a chick home to rear, it would be for life.